As the next wave of first-of-a-kind biorefineries ramps-up, the subject of project engineering once again comes to the forefront. 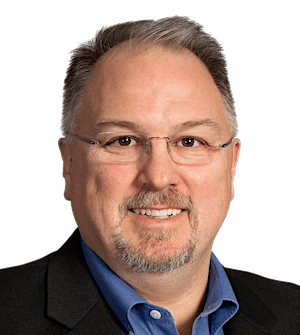 Questions about the overall process, why it takes so long and costs so much abound, all capped off by the realization that an EPC solution counted on is not always the reality. An understanding of the entire process is key for those heading down the commercialization path. 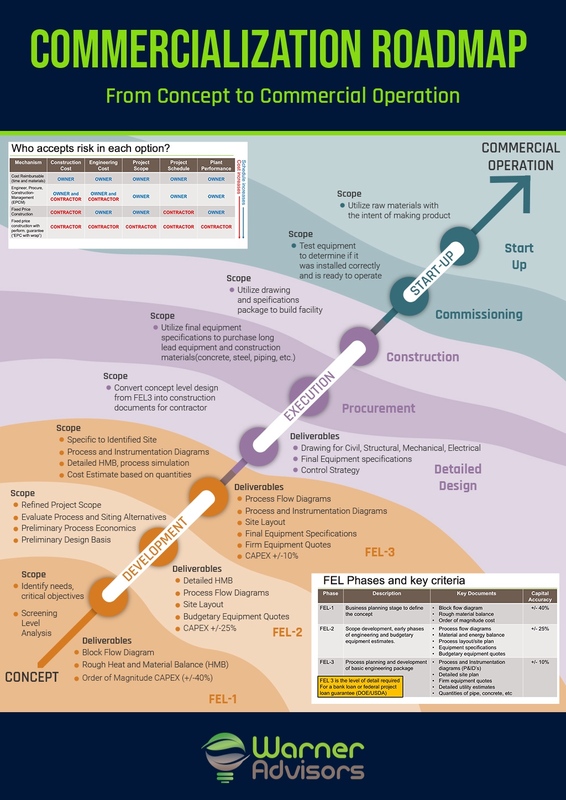 The graphic below is a concept to commercial operation roadmap, with detailed descriptions that follow. Front-end loading (FEL) is the engineering development process to take a concept from the idea stage to the point that funding sources (banks or governmental agencies) and/or company boards of directors can make decisions to move forward on the project. It is structured in a stage-gated process, with each step targeted at developing adequate information to make an informed go/no-go decision on the path forward. The process is typically broken into 3 phases (FEL1, 2 and 3) that collectively represent what is referred to as Front End Engineering Design (FEED). This process usually costs 2-3% of the total cost of the project and needs to be funded by the company before project financing can be secured. The execution phase is the period from the start of detailed engineering to the end of construction (mechanical completion). Detailed design converts the concepts of the FEED package into documents that can be used by contractors to build the facility. Major focus is on developing drawings and specifications for civil, structural, mechanical, architectural, electrical and control systems. Construction begins with the site being prepared, utilities are brought in and foundations prepared. Equipment is placed on foundations and connected with pipes, power and controls. The construction phase is complete when mechanical completion is reached. This is the point where the facility has been constructed, but not tested or operated. Once the plant reaches mechanical completion, the process of commissioning and startup begins. This is a structured process that verifies the operability of each component before operating them individually, then in groups, then as a full process facility. Start-up is the point when raw materials are introduced to the process with the intent to make product. FEL is different than facility construction documents – The development stage of the project is more strategic than operational, with the goal being to set the framework that the project can be built within. It’s focused more on the operational specifications of the process (temperature, pressure, fermentation time, etc) than the equipment details (how thick is the tank wall, what type of concrete foundation). I often describe this as the “interior design” phase of the project, with construction being when the “sheet-rockers” start their work. The world of engineering firms that are good at FEL is getting smaller – As an alumni of the engineering services Industry, I can attest to the fact that few firms do both FEL development work and design/build very well, as they are dramatically different. The development phase is where multiple options are considered, tweaked and morphed into a final project concept. By contrast, detailed design is a very structured process, guided by governmental regulations and requirements. The slowdown in all process industries over the last 5-10 years has impacted the number of firms that have extensive FEL expertise and this is often the more challenging support to find. Understanding engineering industry terminology and typical path forward is a key to ensuring the process meets time, quality and cost expectations.